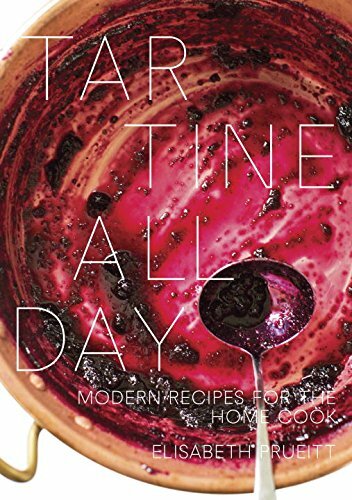 An all-purpose, comprehensive cookbook with 200 recipes for the whole-foods way people want to eat and bake at home today, from James Beard Award-winning and best-selling author Elisabeth Prueitt, cofounder of San Francisco's acclaimed Tartine Bakery. I don't bake often but I thoroughly enjoyed making (and eating) the Cornmeal-Ricotta Upside-Down Cake from Tartine All Day by @lizprueitt_tartine. As promised the cake had a very moist, almost cheesecake-like consistency. The lemon zest shined, each bite a fresh taste of citrus. The Bacon, Lettuce, and Tomato Panzanella with Basil Salsa Verde is the perfect summer salad to enjoy al fresco. Ripe heirloom tomatoes are mixed with torn croutons, delicate butter lettuce and arugula, and seasoned with a bright and green Basil Salsa Verde. Oh yeah, and some bacon pieces tossed in, although you could easily vegetarianize/veganize without out them and would still have a delicious salad. I typically use jarred sauce when making pasta, so no reason for me to snub tomatoes from a can, especially if its the catalyst to making a homemade meal. Not to mention, canning ensures ripe tomato flavor year round. The recipe, inspired by Marcella Hazan's famous tomato sauce with butter, is extremely easy and coaxes flavor from a few ingredients to spectacular result—it will be the highlight to whatever you pair it with. The butter gives the sauce a luxurious, silky, richness, and the onion a bit of sweet to play against the bright acid of the tomato. I believe in Marcella's version you remove the onion, but the directions here aren't so clear. I diced mine and left them in. The 45 minute cook time may seem long, but it needs that amount of time to reduce, and deepen in flavor, allowing the tomatoes to cook down to a fairly thick sauce. These dumplings—a mix of ricotta, greens, and flour (sweet rice and potato in this case)—should be the perfect morsel, but mine ended up a bit bland and dry. The prep was simple enough, simply sauté some greens then bring all the ingredients together before forming dumplings and baking them in sauce. The pale dumplings refused to take on color despite extra time in the oven, and regrettably were missing the corresponding caramelized flavor as well. Cooking in sauce didn't help the texture enough, the dumplings were pretty dry. I can only assume either the gluten-free flour or baking method are to blame. While I found them imperfect, they were still good enough, but I have to wonder if they'd be better following the main instructions (boil, and panfry in butter) instead of the baked variation that I tried. I would try them again with some changes. Recipe on eater.com ↠ .